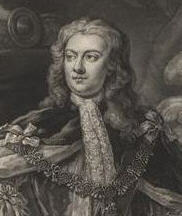 Charles Lennox (18 May 1701 - 8 August 1750), 2nd Duke of Richmond and Lennox followed his father into freemasonry and was Grand Master in 1724. A few days since, their Graces the Dukes of Richmond and Montague, accompanied by several Gentlemen, who were all Free and Accepted Masons, according to Antien Custom, formed a Lodge upon the Top of a Hill near the Duke of Richmond’s Seat, at Goodwood in Sussex, and made the Right Hon. the Lord Baltimore a Free and Accepted Mason. Charles Lennox (29 July 1672 - 27 May 1723), 1st Duke of Richmond and Lennox, one of the few known seventeenth century freemasons, was Master of a lodge in Chichester in 1696.